Do you ever create cards which just don't work out as you think they will? That is the case with today's card. I have to admit I'm not really pleased with this card. But as I like to show you everything I make, whether I am pleased with it or not, I thought I would still show it to you. And who knows. maybe someone will think it is fabulous! I started with a Pacific Point card blank and then made two panels which were slightly smaller, in Melon Mambo and Pacific Point. 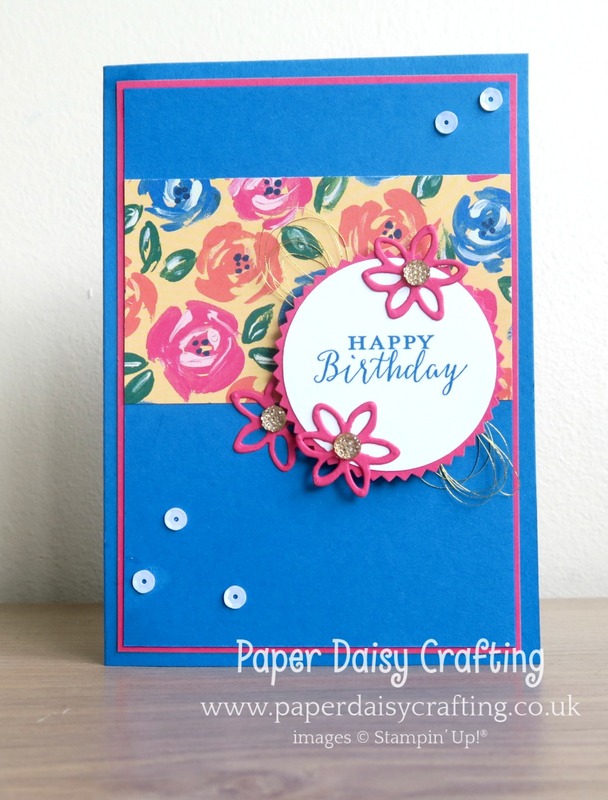 The patterned paper is from the Garden Impressions 6" x 6" pack. The sentiment (from Detailed With Love) is stamped on Whisper White in Pacific Point and then punched out with the 2" circle punch and mounted on Melon Mambo punched out with the Starburst punch. Before I mounted the panel onto the card I stuck some of our Foam Adhesive Strips on the reverse and stuck down some loops of Gold Metallic thread. 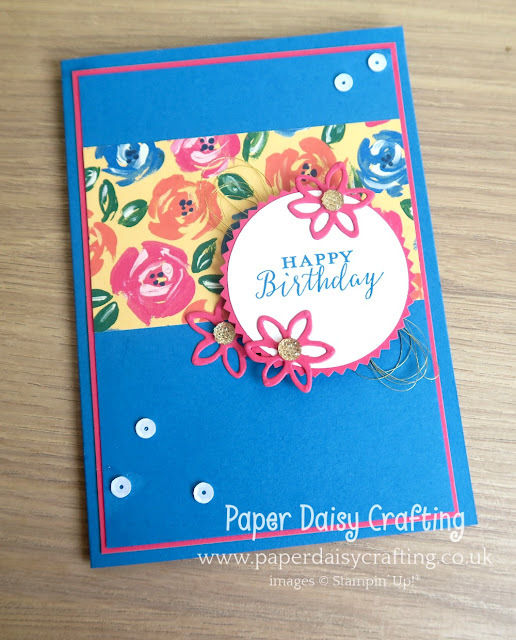 Once the panel was adhered to the right hand side of the card, I then added three flowers in Melon Mambo which were die cut using the small flower die from the Springtime Impressions set. The centres are Gold Faceted Gems and the card was finished off with a scatter of self adhesive sequins. So what do you think. As I said, not my favourite card but maybe that's just me. Please pop back tomorrow to see what else I've been up to!